This aquatic system contains over 62 miles of interconnecting waterways as well as 1,500 bridges and 90 islands. 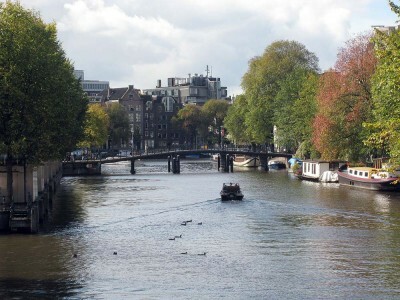 There are three primary channels within the canals of Amsterdam which are Keizersgracht, Prinsengracht and Herengracht. These were excavated during the 1600’s. The creation of the canals was part of an era called the “Dutch Golden Age.” This time period included many advancements in the fields of art, military, science and trade. Some of the historical figures during this age were Rembrandt, French philosopher Rene Descartes, who lived in Holland for 20 years, and Dutch poet and playwright, Joost van den Vondel. The Amsterdam canal district is referred to as “Grachtengordel.” For the most part the canals are centrally located within the city. In 2010, these bodies of water were added to the UNESCO World Heritage listing. Lovely canal homes border the canals including the Anne Frank House built in 1635 which now houses a museum dedicated to the memory of her. Many other Dutch National Heritage locations are also located within this region. Early city planners of Amsterdam decided to utilize canals as a main source of transportation around the town. Most of the canals would accommodate residential traffic but there were also measures taken as part of water distribution and military defensive purposes. The canals military application was tantamount to moats and dikes. More canals were added to address commercial concerns including the timely delivery of beer. Construction proceeded from west to east with famed Dutch journalist Geert Mak once referring to the layout as a kind of giant windshield wiper. All compass points were covered in a phased in development which was a long and arduous process spanning a half century. Many small towns grew up in the polders as a result of the canals. Prinsengracht, or Princes Canal, is the longest of the four main canals of Amsterdam. This canal features along its borders the previously mentioned Anne Frank Museum, the Westerkerk, which is the tallest church in Amsterdam, and the Homomonument, a memorial to all gay men and women who have suffered through persecution because of who they are. Bridges over the Prinsengracht canal lead to one of the most exclusive neighborhoods in the Netherlands called Jordaan. A wide array of upscale restaurants, specialty shops and art galleries await your arrival. Rembrandt passed away in Jordaan after spending the final years of his life there and is buried nearby. Keisergracht, or the Emperors Canal, is the widest of the canals of Amsterdam. It is named after the Holy Roman Emperor, Maximilian I.
Singel canal was originally a moat surrounding the central part of Amsterdam. It is the inner most canal of Amsterdam and eventually runs into the Amstel River.